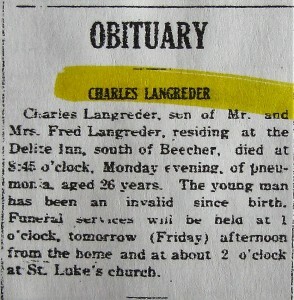 CHARLES LANGREDER, son of Mr. and Mrs. Fred Langreder, residing at the Delite Inn, south of Beecher, died at 8:45 o’clock, Monday evening, of pneumonia, aged 28 years. The young man has been an invalid since birth. 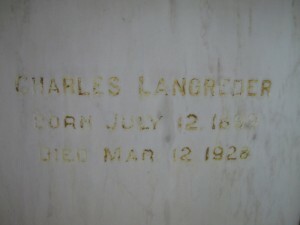 Charlie, as he was fondly known, son of Mr. and Mrs. Fred Langreder, was born July 12, 1899, at Roseland. Fearing that he might not live, he was baptized when a week old. This fear, however, did not materialize and although physically handicapped, Charles was given and made use of every opportunity of gaining a thorough education, and being gifted mentally he succeeded in rising above the average of his age. Always deeply religious, Sunday school attendance and confirmation instruction substituted for him many of the things which he had to forgo in life. The day of his confirmation at Bethel Church always stood out in his life as a day of days. In 1918, he came with his parents to Beecher, locating two and one-half miles south of Beecher, where Charlie grew into clean and exemplary manhood. In his kind and satisfied way, he tried and succeeded to surround himself and those he loved with the sunshine of a happy disposition. Ever since the death of his grandmother – Mother “Christina” Jessen – a deep-seated cold gradually sapped his strength and, although given the best of medical attention and faithful loving service on the part of his parents, he answered the call of his Master at 8:45 o’clock, Monday evening, March 12, at the age of 28 years and 8 months. He leaves to mourn, beside his sorrowing parents, one brother, Walter, Aurora, IL; two sisters, Alice, (Mrs. Frank Leder) and Mildred, Beecher. Funeral services were conducted, Friday, March 16, at 1 o’clock at the Delite Inn and 1:30 st St. Luke’s Church where Rev. G. Horst gave a touching sermon and Rev. John Goebel of Roseland, who confirmed him, also spoke feelingly of the departed. Many floral pieces, expressing sympathy and esteem, bedecked the casket. 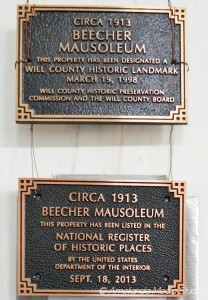 He was laid at rest in the Beecher Mausoleum. The departed, although placed in great tribulation, nevertheless triumphed over many obstacles, and on account of his deep Christian nature always proved himself a loving, dutiful son and brother and faithful friend to those who knew him. This entry was posted in Automated Burial Listing, Bethel Ev. and Reforned church, Burial Listing, Burial Location, HEADSTONE, Obituaries- Have Full Copy, Roseland, St. Luke's UCC - Beecher by Sandra. Bookmark the permalink.